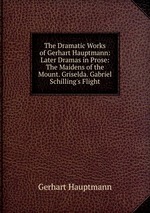 Аннотация к книге "The Dramatic Works of Gerhart Hauptmann: Later Dramas in Prose: The Maidens of the Mount. Griselda. Gabriel Schilling`s Flight"